" We are MANOWAR. We are invincible. Death to False Metal, Hail To England"
By 1984 it was clear the this thing called heavy metal which began in the late '70's was not going to fade away and die. New bands kept cropping up from the four corners of the globe all gunning for the metal crown. What had begun as one movement and one sound was now branching off in new directions , each with it's own moniker and distinct sound. Terms like "Black Metal", "Speed Metal", "Thrash" , "Doom Metal" and " Power Metal" were now becoming part of the typical headbanger's vernacular. Manowar , I feel, were one of the pioneering bands in the realm of power metal. Their dungeons and dragons lyrics , Conan The Barbarian costumes, and bold hyperbole (as quoted above) catapulted them to the forefront of the metal scene. Hail To England is the band's 3rd album and is a logical follow-up to the excellent Into Glory Ride. The band at this time still consisted of the original line-up of : Ross The Boss- guitars, keyboards; Joey DeMaio- 4,8 string bass, piccolo bass, bass pedals; Eric Adams- vocals; Scott Columbus- drums, percussion. The album begins with the powerful "Blood Of My Enemies". A punchy number filled with references to Norse mythology ( a band trademark). Ross-The-Boss rips up the track with his fluid shredding and 'more is more' guitar style. Eric Adams' range and power are immediately showcased . This man may have had one of the best sets of pipes of any of the 'old school' metal frontmen. This track is followed by the hypnotic, pounding "Each Dawn I Die". A war drum beat , accompanied by heavy bottom end from Joey DeMaio on a fretless bass dominate the track. More lyrics dealing with dark forces and unholy rituals. Ross-The-Boss once again rips through his solo at breakneck speed. The third track "Kill With Power" demonstrates the band's ability to turn it up a notch. Scott Columbus gets it started with an ascending drum beat which explodes with Ross' crunchy guitars. This is a go for the jugular aural assault recounting the glory of the battlefield. Nothing subtle about this one, musically or lyrically ( the chorus being :Kill With Power- Die ! Die !). It's another great vehicle for the superlative vocal skills of Eric Adams , who effortlessly reaches notes most singers merely grasp at in vain. The title track " Hail To England" has more of a radio-friendly sound to it. Much more accessible than the previous 3 tracks. It relates the glory of England's naval fleet of years gone by. It's kind of a "metal-by-numbers" track with a typical verse-chorus-verse-solo- verse- chorus �out set up. Track 5 " Army Of Immortals" is dedicated to all the die-hard fans of the band everywhere. It's an hommage to true metal fans the world over. Another straight forward rocker which does feature tasty fills by Ross-The-Boss. More bold hyperbole ( "We Play The LOUDEST Metal etc..) . "Let each note I now play be a Black Arrow of Death sent straight to the hearts of all those who play False metal "- track 6 "Black Arrows" begins with this bold statement before Joey DeMaio launches into an incoherent solo on the piccolo bass. Nothing remotely musical about this track, just masturbatory self-indulgence; although Joey does demonstrates some decent chops, it just runs too long (3:05) before it segues into the album closer and show-stopper. "Bridge Of Death" has the band flirting with progressive rock just a tad. Clocking in at 9:05 the track slowly builds from the bass line of "Black Arrows" , with keyboards in the background to create a lush atmosphere . Scott Adams starts recalling the tale of a man who crosses the Bridge Of Death to give his soul to Satan. Although he can really belt them out, he is also quite the crooner. The song builds momentum and explodes into a bombastic , heavy track with a crunchy power chord foundation. Ross-The-Boss excels in the middle solo as he slowly builds a crescendo then rips through it at warp speed. It closes off one of the premiere metal albums from 1984. 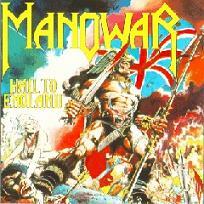 This band's comic book approach to metal may be viewed as sophomoric in retrospect, but Manowar did capture the essence of the metal scene of the early '80's and managed to captivate a legion of fans which has given this band longevity. I rarely travel down this musical path anymore but still find this album highly appealing . Their musicianship and professional delivery of the material stands out from the myriad of newer bands which were cropping up like weeds in '84, only to be choked by their own mediocrity.